This command allows the switch to quickly select another root port if it detects a failure. The new root port moves from blocking to forwarding in under 5 seconds. 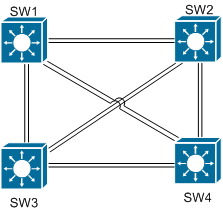 In the below example we will configure SW2 to use uplinkfast. After that, we will disable the links to its root switch SW1. First, we configure uplinkfast globally. Looking at spanning tree, we see that Fa0/23 is currently the root port. After disabling both ports to SW1, spanning-tree makes Fa0/21 root and moves the port to forwarding.